↑ 1.0 1.1 1.2 allmusic "The Beach Boys - Overview". John Bush. Allmusic.com. Accessed July 12, 2008. ↑ "Still America's Band: The Beach Boys Today" Kevin M. Cherry. National Review. Published July 8, 2002. Accessed July 12, 2008. 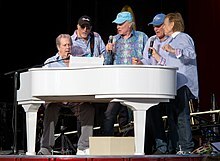 ↑ The Beach Boys: It must be summer, the Beach Boys are in town! toronto.com. Accessed July 12, 2008. ↑ 4.0 4.1 "Beach Boys: Sunny pop veterans are still shining". Martin Lennon. Scotsman.com. Published May 16, 2008. Accessed July 12, 2008. ↑ "The Immortals: The First Fifty". Rolling Stone Issue 946. Rolling Stone. สืบค้นเมื่อ 2008-07-08. ↑ "The Record Setters: Top 10 American Bands"